This good looking Georgian property enjoys a central location in Uttoxeter, just a mile or so from the Racecourse and about 20 minutes drive from Alton Towers. 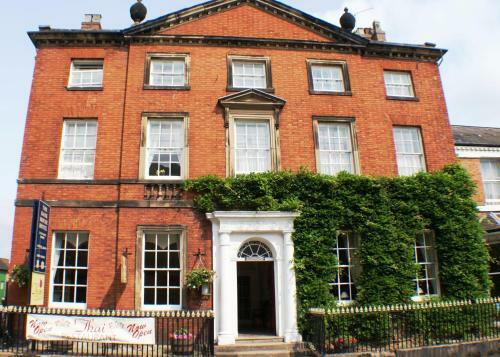 There's style and class aplenty at this 17-bedroom hotel close to Uttoxeter High Street. Back in the 1700s the building played host to the town's first bank and much of its former period charm has been preserved. Guests can look forward to four-poster bedrooms (many with their original fireplaces, although sadly no longer in use), handcrafted beds, a fountain of chandeliers and dazzling oak spiral staircase. The hotel offers free parking, a bar, a restaurant and 17 individually decorated en suite rooms. The the restaurant serves an à la carte menu in elegant surroundings, with a selection of fine wines to accompany your meal. Large meeting/conference room capable of accommodating 40 delegates.